For flamenco players, this model is the quintessential flamenco guitar with its bright, snappy tone designed to cut through the sound of an accompanying dancer. However, any guitarist looking for a new tone to add to the repertoire will feel right at home with the GK Pro. 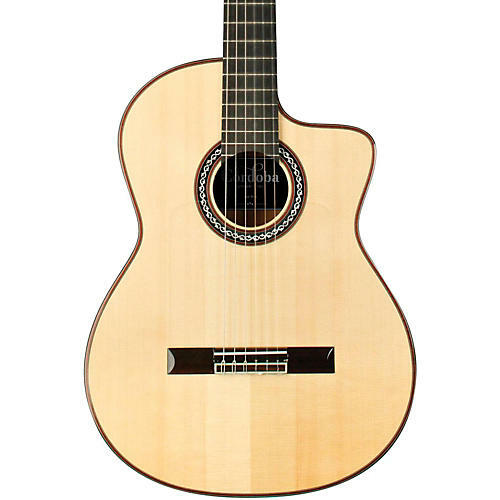 With its comfortable body shape and all solid spruce/cypress wood combination, this model is the perfect choice for exploring the nuances in sound that can only be captured with nylon strings. Aesthetic touches like the flamed maple headstock veneer complete with Cordoba' arches icon, and the mother-of-pearl weave rosette inspired by a 1920' Domingo Esteso guitar add a touch of elegance to this powerhouse. Like every guitar in the Luthier series, the GK Pro is built with Spanish heel construction, where the top of the guitar is attached to the neck, the sides are added next, and the guitar' body is sealed by the installation of the back. It also has a two-way truss rod built into the neck. Other features include an ebony fingerboard, rosewood bridge, high gloss finish, and premium Savarez Cristal Corum strings. The GK Pro includes Cordoba' humidified hardshell case.